The North Carolina Press Association (NCPA) was established on 14 May 1873 in Goldsboro, making it one of the oldest such organizations in the United States. J. A. Engelhard, of the Wilmington Journal, who was elected president, is regarded as "the father of the association." Concerns over the deluge of advertising for quack medicines and other questionable products as well as a need for professional fraternity were motivating forces behind its formation. A resolution that came out of the 1873 founding meeting urged the legislature to obtain and disseminate accurate information about the state's resources, such as minerals. Other early concerns of the association included improving education, the post office system, and roads. In 1875 the NCPA met in Wilmington and decided that the ports of Wilmington, Morehead City, and New Bern needed to be developed. In 1881, at the yearly meeting in Winston, former governor William W. Holden urged participants: "But above all, gentlemen, let us be true to the welfare and glory of North Carolina. Let our chief attention be given to our home interests." In 1883 the association held its annual meeting in conjunction with the Boston Exposition and invited Governor Thomas J. Jarvis to address the group. In 1885 "journalism as a profession" and the poor reading habits of the public were major topics of discussion at the meeting held in Smithville (present-day Southport). In the 1920s the NCPA established an annual contest in news, feature, and editorial writing that helped raise journalistic standards across the state and led to greater professionalism in the North Carolina press. In 1949 the association organized the nonprofit School of Journalism Foundation, Inc., to aid the journalism program at the University of North Carolina at Chapel Hill and encourage excellence in its graduates. In the third quarter of the twentieth century the NCPA began a continuing battle for press freedom and against government secrecy. It opposed an American Bar Association report that recommended considerable secrecy in criminal cases. In the late 1990s, the NCPA stated that its purposes were to protect First Amendment freedoms, to keep public meetings and public records open, to ensure the public's accessibility to the entire state government process, to facilitate communication among members and growth of the membership, to maintain high industry standards, to represent the business interests of newspapers, and to promote literacy. A 12-member board of directors leads the NCPA, located in Raleigh. The organization maintains a legislative committee as well as committees on the future of newspapers, professional development, finance, member services, and membership. The NCPA also retains a lobbyist. For its 125th anniversary the NCPA established, with the North Carolina Museum of History, a permanent traveling exhibit on the history of the press in the state. The association continues to give awards in various categories to encourage high standards. By 2006 membership amounted to 202 newspapers, and services to members included a legal hotline, a home page on the World Wide Web, an annual directory and conference, a monthly newsletter titled the North Carolina Press, a press release service, and a marketing subsidiary to simplify classified advertising. "Legal Victories for the N.C. Press," Editor and Publisher 128 (30 Sept. 1995). 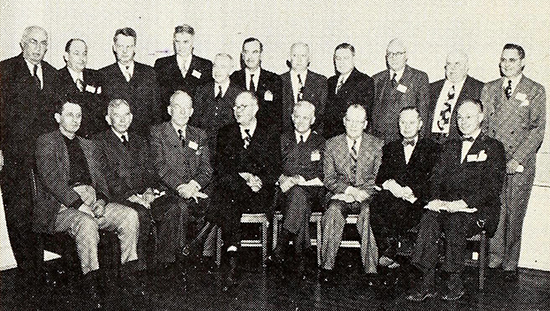 "NCPA Honors Past Presidents," Raleigh News and Observer, 3 Aug. 1963. "NORTH CAROLINA PRESS ASSOCIATION." North Carolina Highway Historical Marker Program. http://www.ncmarkers.com/Markers.aspx?ct=ddl&sp=search&k=Markers&sv=F-51. (accessed May 25, 2012). Parker, Roy, Jr. "NC Press Association" North Carolina Press Foundation. 1998. http://www.ncpress.com/ncpf/ncnie/About_Newspapers/NC_Newspaper_History/RoyParker%203.pdf (accessed May 25, 2012). Belk, Henry. "Press Association Active in Promoting State Papers." The E.S.C. Quarterly 9. No.1-2. Winter-Spring 1951. p.3-4. http://digital.ncdcr.gov/cdm/ref/collection/p249901coll22/id/451988 (accessed September 6, 2012). "North Carolina Press Association Records, 1886-1993" The Southern Historical Collection, University of North Carolina at Chapel Hill. http://www.lib.unc.edu/mss/inv/n/North_Carolina_Press_Association.html (accessed May 25, 2012). Sherrill, J.B., compiler. Historical Records: North Carolina Press Association 1873-1887. North Carolina Press Association. 1930. Wilmington Morning Star, May 15, 1873. UNC Photo Lab. "Press Association Presidents—Pictured are 19 of the 26 living former presidents of the N. C. Press Association, those who attended the "President's Breakfast'" Saturday morning, January 20, in the Carolina Inn, Chapel Hill, a permanent feature of the Press Institute." from The E.S.C. Quarterly 9. No.1-2. Winter-Spring 1951.p.56. http://digital.ncdcr.gov/cgi-bin/showfile.exe?CISOROOT=/p249901coll22&CISOPTR=451988 (accessed September 6, 2012).